Evergreen, low-growing shrub with dark green foliage throughout the year. Flowers rose-pink. Habit compact, after 3 years to 15cm tall, 25cm across. Flowering period October-January in southern England, to April in southern Sweden. This was a chance seedling spotted in Forest Edge Nurseries, Wimborne, Dorset, in 2003. 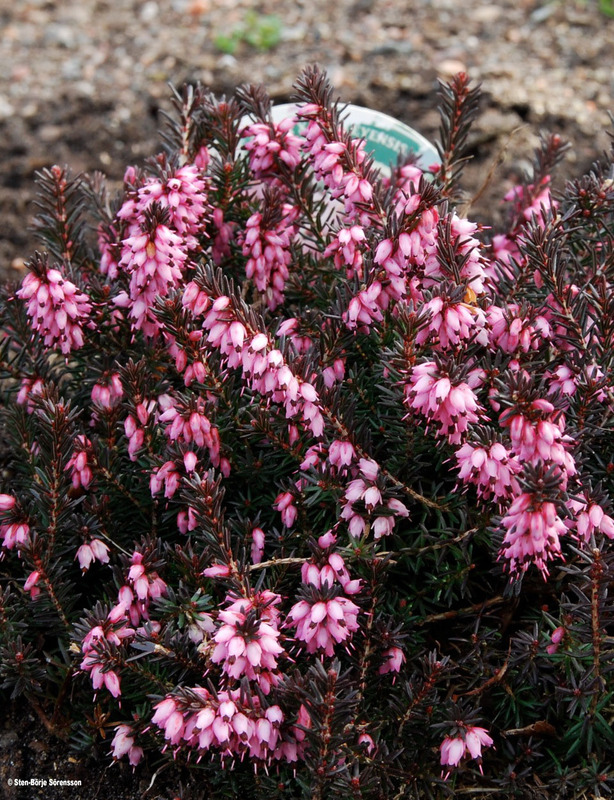 The finder, David Edge, believes it is the progeny of cross-pollination between Erica carnea 'Treasure Trove' (mountain heath) and Erica erigena 'Irish Dusk' (Irish heath) (the latter is one of The Heather Society's recommended cultivars ....see). Similar cultivars of Erica x darleyensis are named 'Irish Treasure' and 'Winter Treasure', both of Canadian origin, raised by David Wilson. These also are compact plants that can bloom throughout the winter and early spring - see "Philomath Frolickings" by Ella May Wulff in Bulletin of The Heathe Society 8 no 4 (Spring 2015), pp 8-9. Habit: Compact, after 3 years to 15cm tall, 25cm across. Flowering Period: October-January England, to April in southern Sweden.